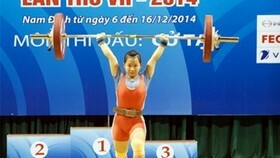 Vietnamese athlete Nguyen Thi Ngoan has won a historic gold medal at the Karate 1-Premier League in Leipzig, Germany. 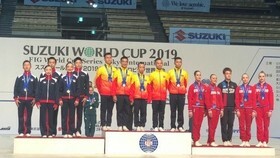 Ngoan was the champion in the women’s 61kg category after overcoming six athletes, including the world winner, to take her title at the one of the most prestigious karate competition in the world on September 10. Earlier, she had been defeated in both individual and team event at the 29th Southeast Asian Games in Malaysia last month. 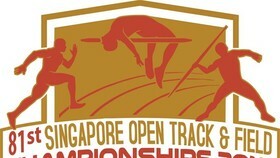 Ngoan was eliminated from the semi-finals of the individual match after losing to an Indonesian athlete. 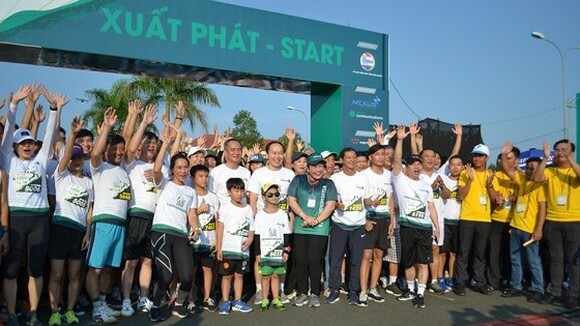 In the team event, Vietnam lost to the hosts. “I have learnt a lot of good lessons in preparation for the K1 tournament although I had only two weeks to practice intensively,” she said. In Leipzig, there were 98 martial artistes competing in Ngoan’s category. She was lucky to get a bye in the first match. She then beat Kandemir Zehra (of Turkey) 1-0, Kornfeld Noemie (Switzerland) 2-0, Orbon Joane (the US) 3-0 and Heurtault Leila (France) 1-0. In the semi-finals, Ngoan faced world defending champion Alisa Buchinger of Austria. Ngoan had no difficulty in winning 2-0 and advance to the final, where she beat number-one candidate Haya Jumaa of Canada.